I love drinking tea. It is my favorite afternoon drink. Before I had children, I simply used a tea kettle in the stove that screeched when the water was boiling. However, with a toddler and baby, the odds of me being able to run to the stove when the kettle was ready were slim to none. 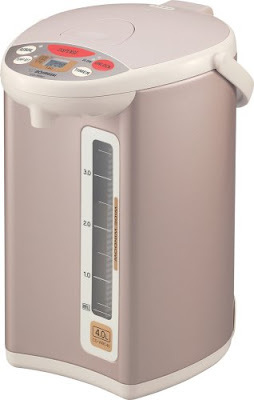 I decided to look for an alternative and found this amazing machine - the Zojirushi Water Boiler. This machine is fantastic! You fill it with water and plug it in - that's it! It will boil the water and then hold it at one of three temperatures (208, 195, 175 degrees) which is wonderful for brewing different types of tea. The water is ready whenever you are! It has become one of those items that I wonder how I ever lived without it. Aside from tea, it is great for french press coffee, soups, hot cocoa, and more! While it is a bit pricey ($117 on Amazon), we have certainly gotten plenty of use out of it over the last three years and would certainly buy it again!